- Customs Duty: We will NOT be responsible for the custom duty or import tax if it occurred. * Bolts have been made from high quality aluminium that resists corrosion, is very strong and has a shine that will last. * This is a replacement spire/speed clip and bolt kit, as used to secure fairings, bodywork, bumpers or just about any panel to another. * This kit is a common size on most bikes but it remains the responsibility of the buyer to check the appropriate size fittings are ordered. - Orders would be shipped out within 3 business days of payment cleared date. Backorder item will be notified by email. - Rearsets are thoroughly inspected before packing and shipping. Bolts have been made from high quality aluminium that resists corrosion, is very strong and has a shine that will last. 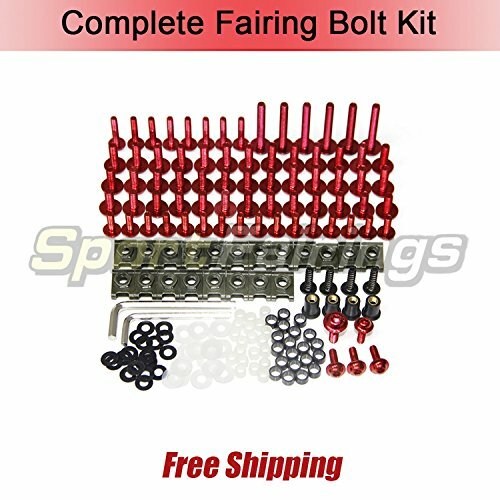 This is a replacement spire/speed clip and bolt kit, as used to secure fairings, bodywork, bumpers or just about any panel to another. If you have any questions about this product by Sportfairings, contact us by completing and submitting the form below. If you are looking for a specif part number, please include it with your message.